The big tourist attraction in the area of Cusco in the high Andes in Peru is Machu Picchu, the mysterious city of the ancient Incas. For centuries Machu Picchu was buried under jungle foliage but while looking for something else Hiram Bingham found it in 1911. Yale then sent in a archaeological expedition to explore it. It is famous for the large rocks that serve as foundations for the many buildings and the tight fit of the stones in the walls. The mystery is that no knows for sure why it was built, what purpose it served or why it was eventually deserted. It is however, one of the great structures of the world and is probably on the "must see" list of that group of people who feel it necessary to see the Great Wall of China, the Egyptian pyramids and the Taj Mahal. After the trip I learned that archaeologists believe that Machu Picchu was built as an estate for the Inca emperor Pachacuki who died in 1472. 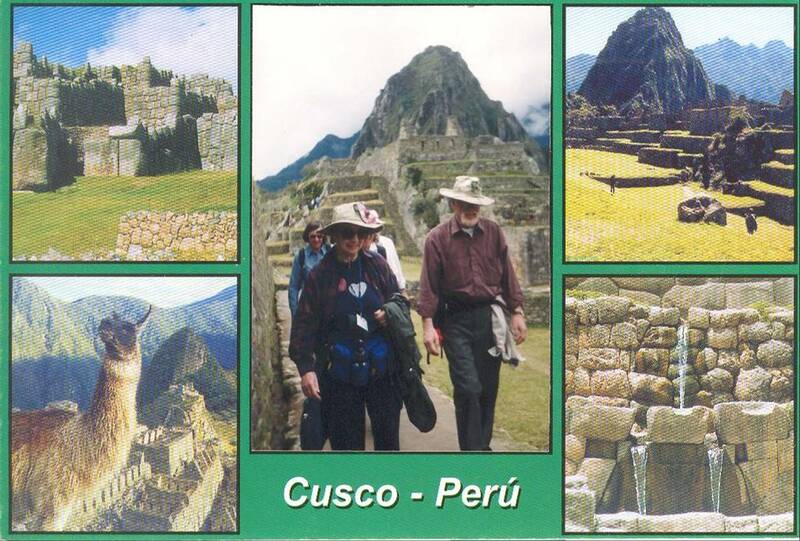 We got there the easy way from Cusco: ½ hour by bus, 1 ½ hours by train and another half hour by bus. More hardy souls take a four day, three night hike that can take them as high as 15,000 feet. Teo our guide told us that Incas were very advanced in the use of herbs medicine. They had a drug store in the bush. Machu Picchu was built around 1450, at the height of the Inca’s power. It was abandoned 100 years later, probably as a result of smallpox brought in by the Spanish. No evidence exists that Spanish ever visited here. A boy offered to beat our return bus to the bottom of the mountain and we could see him sliding down the sides as we made our turns on the curves. He was waiting for us when we reached the bottom to collect tips. My wife Carla and I in a popular photo op. We also visited Pisac, another of many Inca ruins in the area. It faces a wall of a mountain that was turned into a cemetery. Corpses were buried in a fetal position in holes in the wall. Grave robbers have looted most of the artifacts that were buried with them. The question of human sacrifice among the Incas was raised. 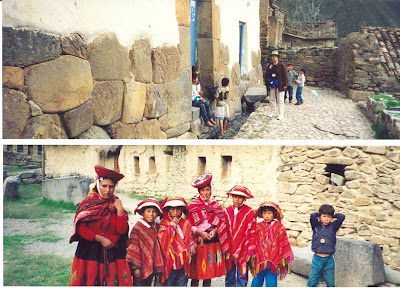 Our guide explained that it was rare among the Incas and was a voluntary gesture on the part of the person sacrificed. This was in contrast to the sacrifices that were done by earlier civilization in which large number of non-volunteers might be killed. We found an example of a Inca sacrifice in Lima at the Museo Nacional de Antropologia y Arqueologia. When we visited it was packed with families, school kids and others all of whom were creating much din waiting in a long line to see La Dama Del Ampato. She is a 14-year-old-girl who had been sacrificed by the Incas and whose frozen body, almost perfectly preserved, had been knocked lose from its place in the mountains by a volcano in 1995. Juanita, the name given her because she was found by a man named John, was trained to be sacrificed and felt it was an honor to be chosen. 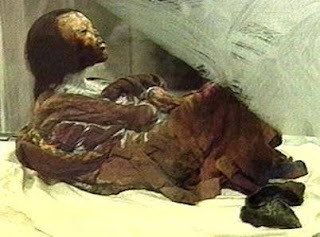 She ate only vegetables the five days before she died, drank a mixture of coca and crista before she died. She was killed with a sharp blow to the head. She was displayed in a refrigerated room into which only a few people were allowed at a time. At the present time she is exhibited at the Museum "Santuarios de Altura,” run by the Catholic University of Santa Maria in Arequipa. One day we took a walking tour of Cusco and were shown colonial homes and churches. 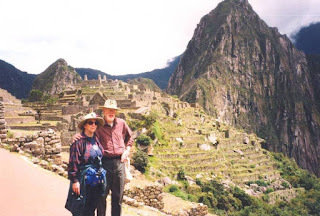 The most memorable church was one built on a Inca temple site and it was easy to see the Inca work since it was laid so straight and the rocks were cut to perfection in contrast to the Spanish building where the rocks looked poorly laid with much plaster used to hold them together. The tools and measuring instruments have not been found. One theory is that the Spanish destroyed them not knowing what they were or destroyed them as simple tools of a primitive power. We became part of a postcard at Machu Picchu. On our way to Cusco, Peru, in the high Andes our tour group first visited some of the Inca ruins which abound in the surrounding area. As we passed by the stone archways into the village of Ollantaytambo I felt as if I had just stepped back in time. This is oldest town built by the Incas that is still inhabited and to my eyes not much has changed in the last 500 years. The stones in the buildings are cut to fit tightly together and the walls lean at an angle to prevent damage from earthquakes. A small stream of water runs in a canal down each street, no longer potable; the water speaks of an age when the Incas were master architects. We were followed down the narrow streets of the town by children hawking woven articles. They and their mothers were dressed in gaily colored costumes from another century and they posed for pictures with their hands outstretched for the expected tip. As they sat or walked many of the women were spinning yarn on hand spinners or making belts on hand looms. Our tour group of 20 invaded one of the many courtyards which branched off the cobbled streets. In one corner a man sat at a loom weaving a tapestry. Like most mountain people he was short with strong looking legs and a large chest capable of getting the most oxygen out of the thin air. He is evolution's solution to living on steep mountains above 9000 feet. He doesn't bother to look up at us. The fifty foot square yard was surrounded by living quarters, large rooms really, in which extended families live. We accepted an invitation to come into one and found ourselves in a large, semi-dark room with a 16 foot ceiling made of rushes and branches with the sun peeping through. Our guide explained that even in the rainy season the water never reaches the floor. It was difficult to avoid stepping on the multi colored guinea pigs massed on the floor. There is no refrigeration of food so they were awaiting their turn to be served as dinner some day in the near future. A niche in the wall held the family worship center with flowers, a candle, a small doll and most strikingly, grampa's skull. He is staring blank eyed at what is happening to his posterity. 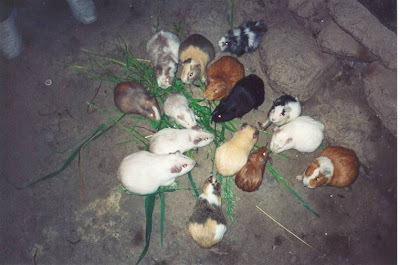 No refrigeration so the locals keep live guinea pigs around as part of their food supply. Back on the street we saw that it was a poor day for business; there were more Incas selling things than there were buyers. There were many persistent children. I asked how big the families were. Our guide said that in this area they are moderately sized since the women have good control over their fertility. He explains that Inca women have a plant they use which works as birth control. They start taking it when they have as many children as they want and if they take it long enough they become permanently infertile. Street scenes from the village Ollantaytamhbo in Peru’s high Andes. For over 3,000 years Peruvians have been making pottery, weaving cloth, building large edifices and conquering territory. There has been an interesting ebb and flow of states, small nations being combined into big ones which fall apart into small nations which again combine under strong leadership into a large nation. This civilization reached a peak under the Incas who conquered territory that included over a third of South America and rivaled in size the largest kingdoms that have ever existed in any part of the world. Unlike the Spanish who conquered them in 1532 the Inca respected the religion of the conquered people and conquered by many means. Sword and shield was the last step. Much of the building we saw was done as a form of taxation in which conquered people were required to perform two months work constructing roads, public buildings and storehouses for food. We were at 9000 feet headed for 11,500 in Cusco. At this altitude a number of us were showing signs of altitude sickness; headache, tiredness, insomnia and loss of appetite. Having a head cold didn't help. The Incas when tired and hungry chew coca leaves, from which cocaine is made. It was recommended that we drink coca tea to help adjust to the altitude and most people found it helped them. I found I had to take a Diamox. Even at 11,000 feet the crops growing on the Inca built terraces looked green and hearty. 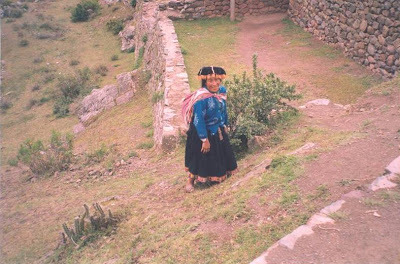 The Incas experimented with a wide varieties of different crops to find the ones that were best for each altitude. For example, they had two hundred different kinds of potatoes. The slopes in the high Andes are often difficult for the Incas to work. In the Cusco region there are two seasons, rainy and dry. September to April is rainy the other season has frost so there is only one harvest a year. Because of the altitude the farmers must depend totally on rain and because they can not use irrigation as they can do in much of the country. Slopes are difficult to work. 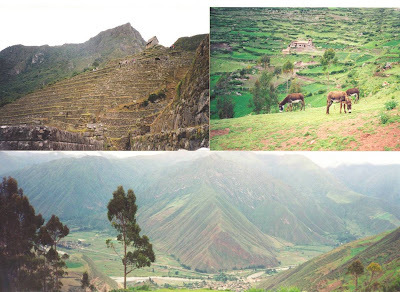 They have few animals, machines can work the steep mountain sides so labor is mostly human as they are using techniques developed by the Incas. For them soil and water was more important than gold and silver. They can predict the amount of rain they will get in season by watching such signs as the nesting patterns of local birds. They then set up their terraces accordingly to control for erosion and the amount of water they direct to an area. To avoid drought and frost problems they used only resident plants and plant different varieties of some plants. No chemicals or pesticides are used on their crops and they begin plantings at different times. They learned to dry potatoes by leaving them in the ground while it alternately froze and thawed. evolutions solution to living at 10,000 feet. Everywhere in Mexico, you will find folk art and handmade crafts for sale - in the streets, in markets and galleries and from vendors who approach people reading on a bench or drinking coffee in a sidewalk cafe. I saw some of the best of these crafts when I was spending a sabbatical semester in Morelia, Mexico, a historic city on the high mesa between Mexico City and Guadalajara. I lived with a physician and his family who spoke only Spanish, giving me an opportunity to inflict my attempts at conversation on a compassionate audience. At one point after my wife, Carla, had visited me, the master of the casa took me aside to caution me that my marriage would get into trouble if I didn’t learn to use the command voice necessary in talking to women and children. Later, my psychologist wife wryly informed me that some well-intended advice is better not taken. Besides taking courses in Spanish language and Mexican cooking, I also was studying Mexican anthropology. As part of the latter course, the class visited a number of the craft villages within easy driving distance of Morelia. Craft villages? The concept had been completely new to me. These were towns or villages specializing in one handicraft. For example, Capula, a small town near Morelia, produces a low-fired pottery with designs formed with many tiny dots. Aranza made lace; Huetamo, gold objects; Paracho, guitars and chess sets; Tzintzuntzan, pottery; Santa Clara copper products; and Nurio, woven woolen goods. At least a dozen of these villages exist. How had this come to be? What had caused them to decide to specialize? For hundreds of years, the area now called Michoacan had been the home of the Tarasco Indians. They had developed an advanced society, successfully resisting being dominated by the Aztecs. They had developed a number of methods of working with the copper, silver and gold in the area and were already masters of pottery and weaving. The Tarascos, however, were no match for the Spanish and were not only conquered but subjected to a reign of terror under Nuno Beltran de Guzman. Many of the Tarascos were tortured, worked to death in the fields and mines or simply hunted down and killed before word got back to Spain about what was happening. Guzman was arrested and spent the rest of his life in prison. Salvation for the Tarascos came in the form of Vasco de Quiroga, appointed bishop of the province in 1537. He was interested in developing a utopia and saw this area as the place to establish it. Besides religious education, he brought them additional instruction in arts and crafts that built on the skills they had already developed. The bishop then assigned a craft to each village. Those assignments endure. The skills they developed in the 1500s have been passed down, and the members of these villages are considered among the most skillful crafters in Mexico. The work is still done with hand tools and techniques handed down through the centuries. As I watched them work in various villages, I wondered how often someone who had the natural talent to be a great goldsmith had been born in a guitar-making village or, even worse, one that made only objects of straw. To my knowledge, none of these crafters became rich, but it was a living. Now, however, there are problems. Chinese factories can easily make pots, guitars and woven fabrics much cheaper than the Mexicans can with their traditional hand methods. I’m told we might not be able to take advantage of these centuries-old traditions much longer, as many artisans are closing shop and moving to the large cities. For those who don’t have time to see the villages, the state-run Casa de Las Artesanías in Morelia has a great collection of reasonably priced pottery and folk art. WAS A BLACK LAWMAN THE REAL LONE RANGER? FORT SMITH, Ark. - That the likely model for the Lone Ranger was Bass Reeves - an ex-slave who worked most of his career as a deputy U.S. marshal for a famed hanging judge - was one of the most interesting things we learned when we visited Fort Smith, Ark. We attended a lecture by Art Burton, a black historian from Chicago who has spent much time in the Arkansas-Oklahoma area studying blacks’ contributions to the settling of the West. 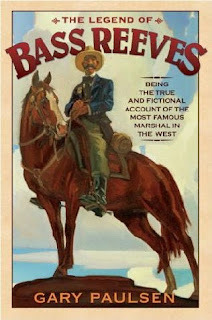 Among his three books on this era is a biography of Reeves, whom he indicated was probably the greatest law enforcement officer to bring order to the West. Reeves arrested thousands of criminals, could shoot straighter, lift more and do things that only movie heroes ordinarily can do. He was black, therefore the mask; he was a master of disguise, which he often used to penetrate areas where criminals were. He had a lot of similarities to the Hollywood Lone Ranger, his American Indian friend, Tonto, and his horse named Silver. Reeves had lived with American Indians, spoke their language and often rode with one as a companion. He gave out silver dollars and among the many horses he used was a large white stallion. Why the connection between Reeves and the Long Ranger? Many of the criminals arrested by him were sent to prison in Detroit, the city where the concept of the Lone Ranger was developed. When Burton first heard the stories about Reeves, he thought they were legends because his exploits seemed so impossible. Careful research on his part showed that the legends were for the most part true. Burton thought Fort Smith was one of the most important, if not the most important, of the historic towns in the West. After lunch at Rolando’s, a favorite restaurant among the residents of Fort Smith, we walked over to the Fort Smith National Historic Site, run by the National Park Service. As is usual when the NPS is involved, this was a first-class operation. Our tour started with a 23-minute film on the history of Fort Smith. We learned that this had been an important national control point because American Indian tribes passed through here as they were being moved to Indian Territory, now Oklahoma. American Indian police were in charge of controlling crime among American Indians but were not allowed to arrest whites. For a time, deputy U.S. marshals were not allowed into Indian Territory. As a result, a large number of criminals hung out in safety there. To help bring law into Arkansas and Indian Territory, President Ulysses Grant sent in Judge Isaac Parker, who became known as the "hanging judge" because of the large number of prisoners he sentenced to the gallows. The original prison was in the basement of the courthouse, which was part of the old fort that had stood here. In the open prison area, many men were crowded together under primitive and horrific conditions. As we stood in the center of the area, voices came from speakers in different parts of the ceiling, re-enacting and explaining events that had happened here. 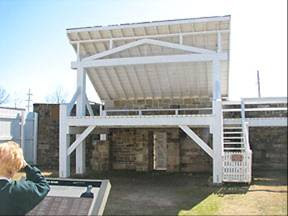 The second floor of the fort has the main exhibits, which are a combination of large posters with information about different groups from the area, glass cases with weapons and tools of the time, cells like those built when the prison was moved to this floor and interactive videos on the Indian Territory, the Trail of Tears and preserving American Indian and pioneer culture. These videos include commentary from present-day descendants of the early period and demonstrations of aspects of American Indian culture, such as dance. We found the most informative presentation to be a film on the deputy U.S. marshals who were sent in to help Parker bring law and order to the area. These deputies were paid little, took great risks and had an unusually high death rate. The film said that 100 of them were killed carrying out their duties. This is higher than the number of murderers who were hanged at Fort Smith. Of the 150 men sentenced to hanging, only 79 met the hangman. Parker never attended a hanging, and the hangman was not paid extra for his services. At a reconstruction of the original gallows near the courthouse, a recording describes what went on here. Fort Smith is one of those places rich in historical events. The town struck us as having the richness of history that we find in St. Joseph or Independence, Missouri. gallows where 79 people were hanged.